My favorite science fiction film of the 1950s was The Thing from Another World, an RKO cheapie that was superbly written and, for me as a boy who grew up in that strange era, utterly frightening. The whole film takes place in a research camp in the remote arctic north of Alaska. 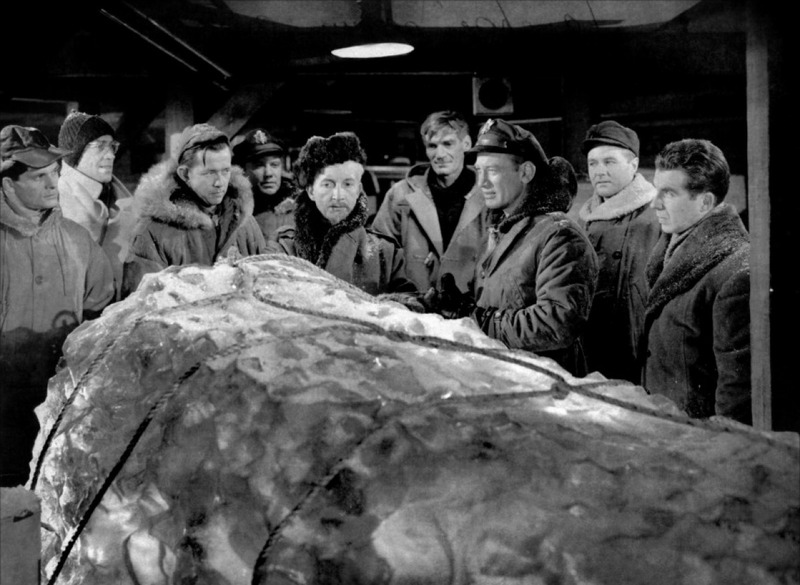 An army officer (Captain Hendry) receives orders to investigate the landing of an unknown object weighing some 20,000 tons (18 million kilograms)—far above the weight of known aircraft of the period. Also, it could not be a giant meteor because it went up before ultimately landing. 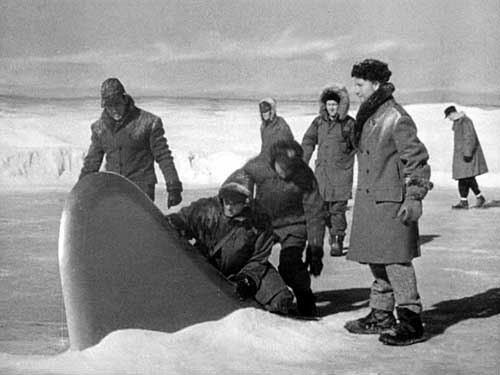 He flies up to the research station and, the next day, scouts out the landing site, in which the entire craft with the exception of a protruding fin is under ice. Hendry’s men line up above the visible edges of the vessel to determine its shape (it is circular, of course) and test the fin for its composition (an unknown alloy of some sort). To study the vessel more carefully, Tobey employs thermite bombs to melt the ice around it. Unfortunately, it also blows up the space ship. In doing so, a large (8 feet or 2.5 meters) figure is thrown from the ship. Still encased in ice, the figure is flown back to the research station. Tobey orders the windows of the supply room in which it is stored to be broken to keep the figure frozen in ice. One of the guards on a later shift puts an electric blanket over the space alien—for such it turns out to be. The ice melt, the creature awakens, and it immediately goes on the attack. The scientists at the station, led by the venerable Nobelist Dr. Carrington, immediately deduce that the priority must be to communicate with the “obviously” superior creature, even if it turns out to be suicidal in the end. Captain Hendry, on the other hand, is more concerned for the safety of the military and scientific staff. During the beast’s rampages, there is an almost total radio silence with the civilized world because of severe storms. This 87-minute black and white film was produced in the same year that saw The Day the Earth Stood Still and When Worlds Collide, and it was more successful than either film. My only reaction to that is, to use an expression from the film, “Holy Cat!” By the way, the beast was played by James Arness in his first role. The film was signed by Christian Nyby as director, though it clearly shows signs of having been heavily influenced by producer Howard Hawks.